We now turn our focus specifically to the sport industry. Except for conducting the occasional project, research has not held a regular role in the typical sport organization. In many ways e-mail marketing has experienced a healthy metamorphosing into part of a long-promised broader digital marketing arsenal focused on what matters most for most businesses - making money. In this section, we consider several emerging issues at the intersection of the law and sport marketing. 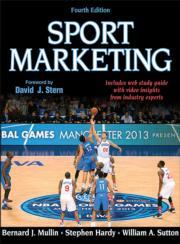 This text maintains its position as the best-selling and original text in the field, continuing to direct students to a better understanding of the theoretical backbone that makes sport marketing such a unique and vibrant subject to study. Instructors may also take advantage of the student web study guide and complete package of ancillaries to enhance learning and presentation of core concepts. All materials, including the web study guide, instructor guide, test package, presentation package plus image bank, and LMS-compatible chapter quizzes,are available online.